On the morning of my third and final day in Xi’an, I visited the Big Wild Goose Pagoda, about a ten-minute bus ride south of the old city walls. 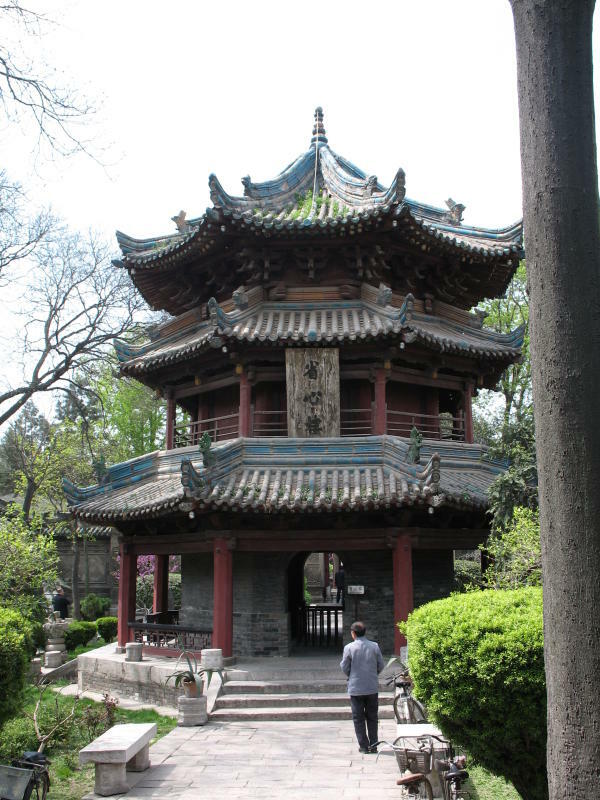 The pagoda was originally built in 652 to hold Buddhist sutras brought from India by the Chinese monk, Xuanzang, whose travels were the basis for the enduringly popular novel, Journey to the West. Xuanzang set out for India at age 28, heading west from Chang’an (Xi’an) along the Silk Road through the deserts of central Asia, and then south into India via present-day Afghanistan. He then spent about 15 years traveling and studying in India before returning to Chang’an with 657 sutras. Xuanzang had to sneak out of Chang’an when he began his trek, since China was at war with the Eastern Turks and travel was restricted, but after his return, he was made the abbot of a temple and received imperial support to create a translation bureau to convert his mountain of Sanskrit sutras into Chinese. The translations he produced spread throughout East Asia and had a significant effect on Buddhism in the region. 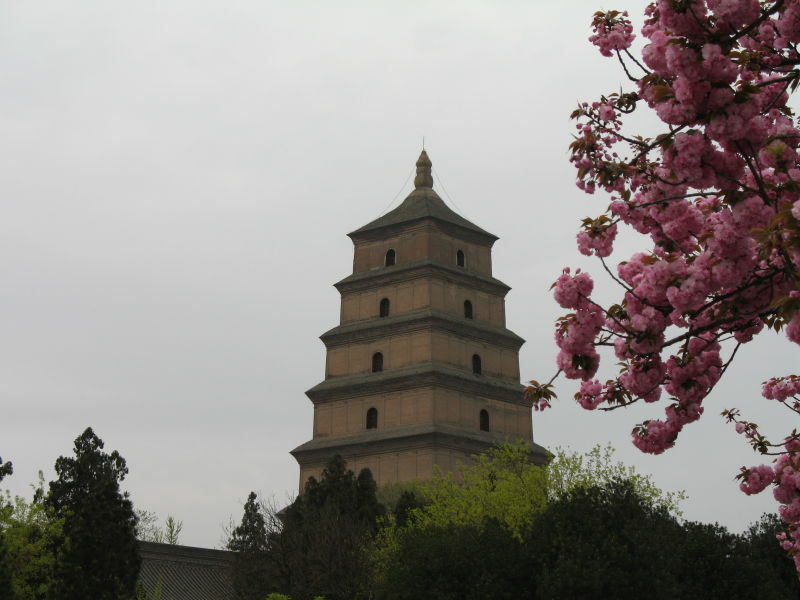 So Big Wild Goose Pagoda is a very important historical site. Unfortunately, the temple’s current state is somewhat depressing. The buildings are kept in good condition, but at least four have been turned into souvenir shops, and there was even a shop on the first floor of the pagoda itself, selling tacky toys with flashing lights and noisy sound effects. Meanwhile, signs prohibit any “superstitious activity” – i.e. actual religion – at the former religious institution, which is now a tourist attraction first and a temple not at all. Luckily, my day didn’t stay depressing. 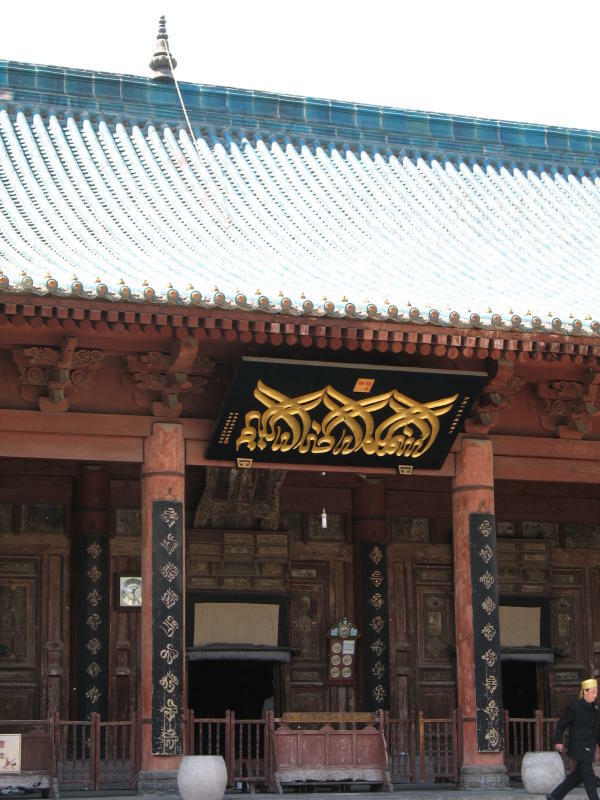 When I moved on to the Great Mosque of Xi’an, the situation was very different. 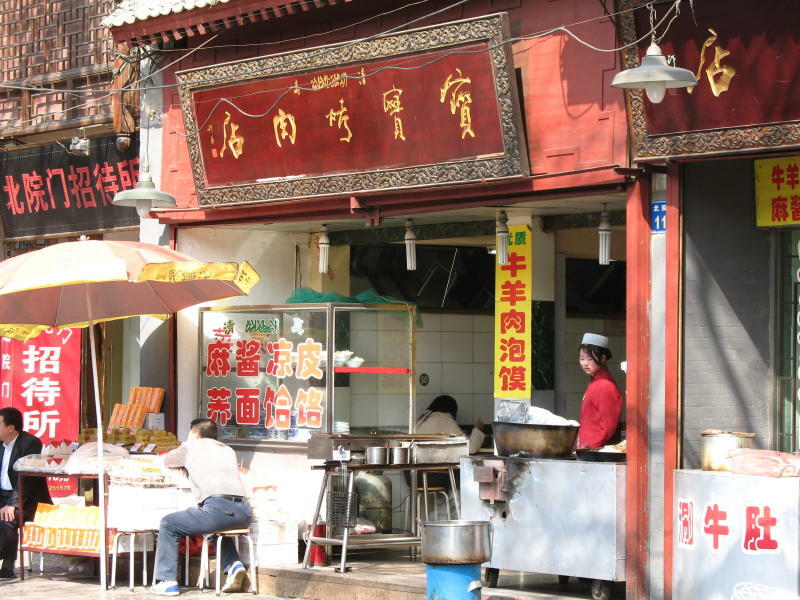 With its position at the northwest edge of central China, Xi’an has a community of perhaps 60,000 Muslims, mostly belonging to the Hui ethnic minority, and mostly living together in the city’s “Muslim Quarter.” This is a halal restaurant in the Muslim Quarter. If you look closely, you can see Arabic on the shop sign and the glass case. The Great Mosque has been the center of worship for this community since its foundation in 742, and it was clearly clearly receiving the love and respect sadly absent from the pagoda. For example, shortly after I arrived an afternoon prayer service began, and when it was finished, I saw the worshipers clearing fallen twigs and seed pods from the walkways as they departed. And certainly, no one was selling anything. The name board is in Arabic, but you’ll notice that the building is completely Chinese in style. In fact, the whole mosque looks like a temple. 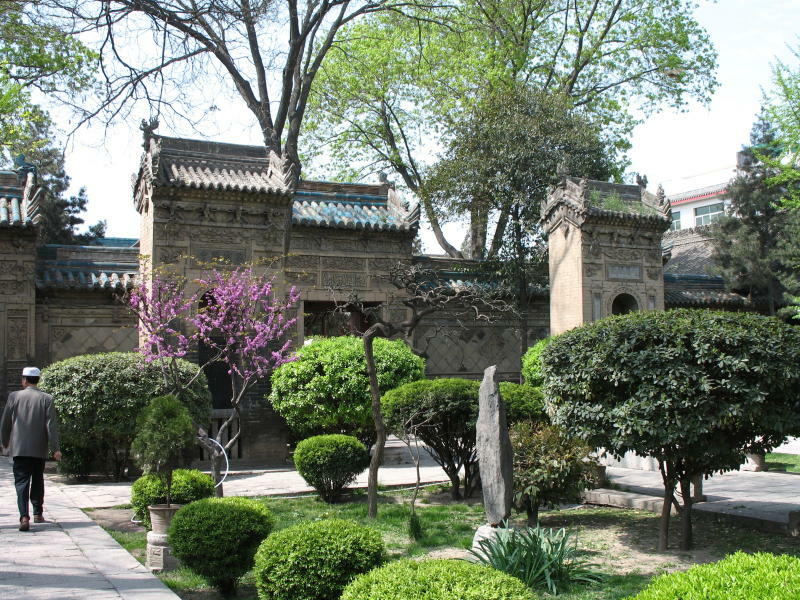 The current buildings mostly date from the Ming dynasty (1368-1644). This is the mosque’s minaret. Leaving the Great Mosque with my mood repaired, I wandered around Xi’an for the rest of the afternoon and then took an overnight train to Beijing. And that’s where I’ll pick up next time. You are currently browsing the Erratic Dispatches blog archives for June, 2008.